Clashes have continued overnight in Bahrain's capital, Manama. Security forces fired tear gas and stun grenades at protesters who gathered ahead of the first anniversary of the start of pro-democracy demonstrations in the Gulf kingdom on Tuesday. Thousands are expected to march on Pearl Roundabout - the focal point of protests last year - which opposition leaders have vowed to retake. At least 60 people have been killed since the uprising began last February. 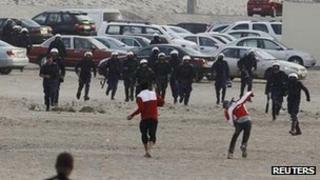 Riot police and other security forces have been deployed across Bahrain. A resident of the Shia village of Sitra, on the outskirt of Manama, told the BBC that security forces had fired tear gas and stun grenades throughout the night. On Monday evening, demonstrators advanced about 2km (1.5 miles) towards Pearl Roundabout before they were pushed back by riot police, the Reuters news agency reports. "We will not back down,'" Nader Abdul Imam, who sought shelter in a house with other protesters to get away from the tear gas, told the Associated Press. The situation right now is that downtown Manama is quiet, almost eerily quiet, a year on from the peaceful takeover of Pearl Roundabout. There is a very heavy police presence, with personnel stationed on the corners of major roads. Many roads leading to the capital were also blocked. A few people have made their way to Pearl Roundabout, but any kind of mass demonstration there has not yet materialised. However, there have been many disturbances in predominantly Shia villages on the outskirts of the capital. Police fired tear gas and stun grenades at protesters overnight. In Sanabis, there was very heavy use of tear gas, and a resident of Sitra said the streets outside his house were littered with spent tear-gas canisters. The government, which is dominated by the Sunni royal family, says it is meeting its commitments to introduce political reforms and curb the police. But the mostly Shia opposition says the government is not doing enough. Most of the demonstrators are from the country's Shia Muslim majority, which has long complained of discrimination at the hands of the Sunni royal family, the Al Khalifa. Khalil al-Marzuq, a politician from al-Wefaq, the largest opposition party in the kingdom, urged protesters to be peaceful. Speaking on the BBC's World Service, he said: "This is a non-violent movement and should continue to be [a] non-violent movement." "Because your cause is justice and you will get at the end what you want." Last month, King Hamad Bin Isa al-Khalifa attempted to address some of the protesters' demands by announcing constitutional reforms intended to lead to greater accountability. He also ordered the rebuilding of Shia mosques demolished by the government and the reinstatement of those who had lost their jobs, and appointed two British lawyers to overhaul the judicial system. But the opposition, as well as human rights groups, say little is being done to curb the country's security forces. An independent inquiry was set up by King Hamad after growing international condemnation of human rights abuses. In a report in November, it confirmed excessive use of force and systematic torture of prisoners in detention by security forces. Last February, protesters occupied Pearl Roundabout for a month and were only driven out after neighbouring Saudi Arabia and other Sunni-ruled Gulf states dispatched troops to Bahrain to help. The government subsequently demolished the large Pearl Monument that had towered over the roundabout. It remains sealed off.